We are a leading Manufacturer of disposable pipette tips from Mumbai, India. We are one of the leading Disposable Pipette Manufacturer in India as well as South East Asia. Our Pipette Tips are manufactured using high grade-raw material procured from the reliable vendors of the market, these tips are ideal for efficient pipetting performance. 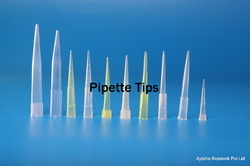 Available in various shapes and sizes, these pipette tips are properly labeled and are designed to meet the changing demands of the the customers. In addition to this, we also provide customization as per the exact specifications laid down by the customers. These Pipette tips are made of special grade polypropylene, non-wetable and autoclavable at 120 Degree C .
022-01 Yellow / White tips, Eppendorf type. 1 - 200 l.
022-02 Micro tips, Eppendorf type. 200 - 1000 l.
022-03 Micro tips - yellow / white 0.5 - 50 l.
022-04 Micro tips 0.5 - 20 l.
022-05 Pointed tips (yellow and white) 1 - 200 l.